I spend a great deal of time with my clients learning their stories. Some of those stories are unique - memories of setting fire to kitchens with firecrackers, seven year pen-pal relationships that span continents and grow into true love, and getting stuck in VW buses on mountain tops in Switzerland. Many of the stories are seemingly mundane - baking cookies with Grandma, playing Barbies with sisters in the basement, sharing rooms with a not-so-neat brother. All of them are meaningful and shape the people those clients have become. Even more than hearing the stories that were Ray’s alone, I loved to share the stories that were ours together. The day he proposed to me on a beautiful bluff overlooking the Colorado Rockies, when the weather started as a gorgeous 75 degrees and changed to snow and 32 within an hour. That time we went skiing and he convinced me to do a black diamond hill, then raced to the bottom - unaware that I spent thirty minutes alone and struggling to keep my skis on! The birth of our first child, when he took a nap while I was in hard labor, and the birth of our fifth child, when we both realized that my life was in danger. Or the moment I woke up to see him holding our baby in his arms, ready with a gently suggested name for our beautiful baby boy. I was always aware, even after knowing him for nineteen years, that there were many of Ray’s stories I hadn’t yet heard. That was okay. We were young, and I had plenty of time to learn them. I likewise knew that we had a lifetime to rehash our journey together. To laugh at how angry I was when I came down off that black diamond run, to cringe at the pain of having babies whisked off to NICU, and to bask in the remembered joy of holding each of those precious bundles in our arms. But one morning everything changed. Ray had a heart attack - a full cardiac arrest. Lack of oxygen caused a brain injury, and robbed him of the bulk of his memories. Ray doesn’t remember the ski trip to Colorado, let alone that black diamond run. I had to show him the scar to convince him that I’d ever had a c-section. He doesn’t remember that Evan Michael’s beautiful name was entirely of his own making, and he’s confident that he was amazingly supportive through every moment of every labor and delivery. 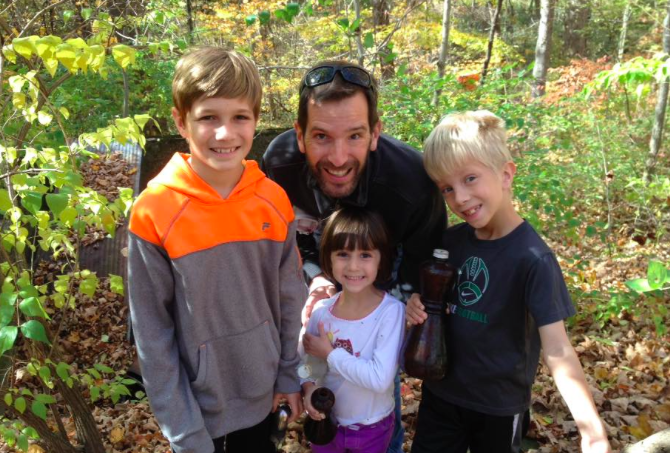 Ray with three of our kids, when we went hiking and scavenging through an old dump on a friend’s property (surprisingly fun!). This photo was taken a few weeks before his heart attack. Our children will never hear their father recount the tale of that time he showed up at the wrong house, stuck beer in the wrong fridge, and heard his friends yelling through the phone, “Ray! You’re in the wrong house! You’re in the wrong house!” They’ll never see the smile on his face or the laughter in his eyes when he goes on to describe running back into the house to grab the beer out of the stranger’s fridge, or the look of horror as he relives the spinning tires or the squelch of the mud as he attempted to flee. I’ll never join in his laughter over the stories I heard so many times that still brought me to happy tears. I’ll never verbally spar over whether a father’s nap during labor is a good idea - or a bad one. I’ll never nestle into his arms as we remember that moment when we both realized the doctor was suggesting my life could be lost on the delivery table. A book. It’s something so simple. If we had one recounting Ray’s stories, I might hand it to Ray and say, “Here. This is your story.” The memories would be documented, fully fleshed out, and easy to share. I could hand it to our kids and say, “This is what Daddy was like when he was younger,” and they’d have those stories to cherish forever. On nights when I miss the man that he was - though eternally grateful for the man that he is today - I could read a few pages and relive those memories that have already begun to fade. And that’s why I’m passionate about personal history. It matters. It matters for families, friends, loved ones, survivors. It matters at every age, because none of us is guaranteed tomorrow. It matters because we matter, our lives matter, our stories matter. They should be documented. They should be shared. They should be celebrated.